On the long drive home from a funeral in Georgia to my home in Wisconsin: the idea came to me of how I could honor my Aunt Mary Edith Bramblett; who had just died. You are now looking at my idea! When I was 12 yrs. old I spent a month with my aunt in GA. She showed me how to sew on her little featherweight sewing machine. On this visit, she would teach me a few skills that would later transform my life and career! 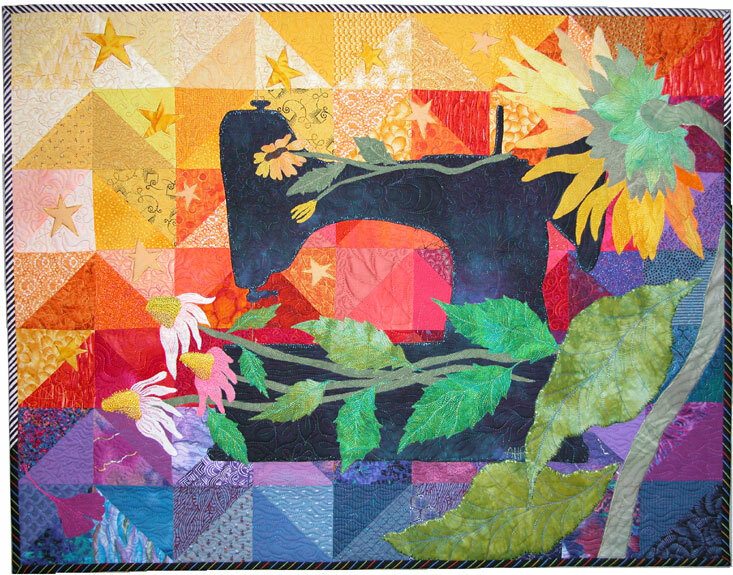 In the center of the quilt, you will see the silhouette of that little machine, which had previously belonged to my Aunt Nelda Vibrans, my grandfather’s sister. Sewing and our love of Winona Lake IN are the things that bind the three of us together. Resting on top of the machine is a black eyed Susan, a flower that blooms freely at Winona. The coneflowers at its base are for me. 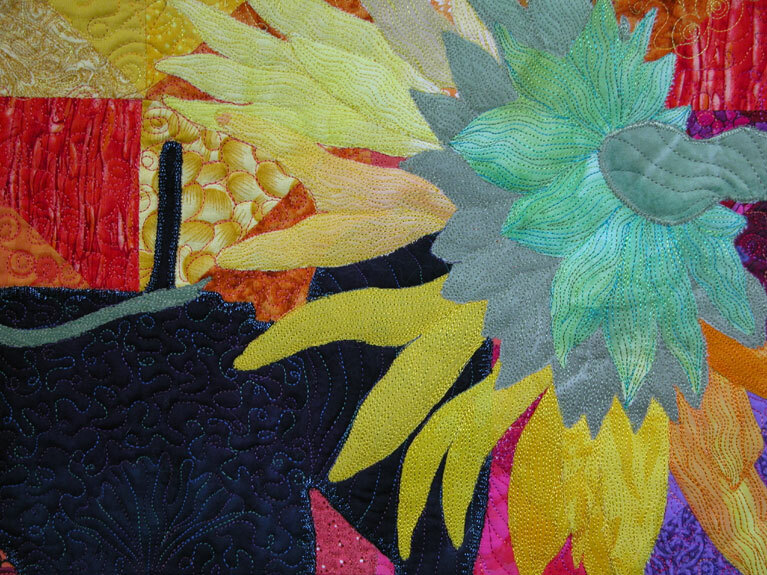 The sunflower on the right is symbolic of the flowers grown in her son’s garden, and the flowers that rested on top of her coffin. 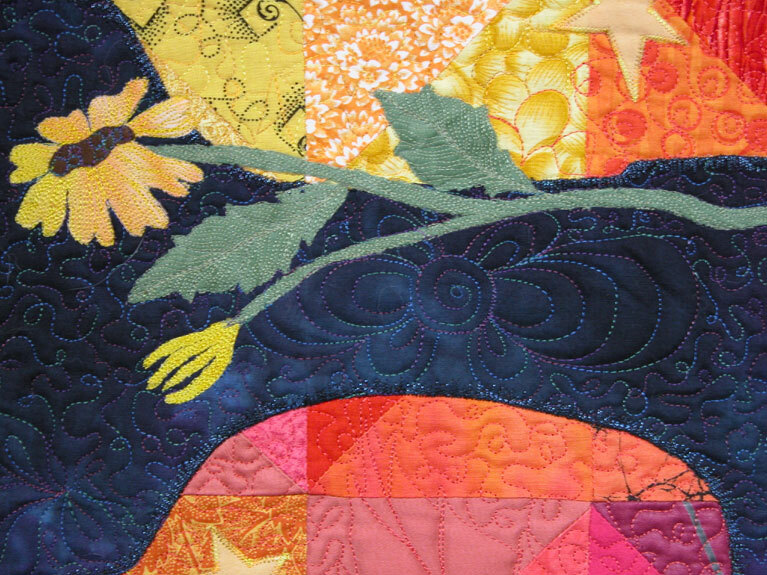 The lower edge of the quilt is blue for the water at Winona Lake, and the ginkgo leaf hidden in the corner is from the swan pond there. If you look closely you will see 11 stars. Similar stars were painted on the ceilings of ancient Egyptian tombs to help their tenants find their way to their next life. May these stars light her way. This is a joyous quilt, not a sad one, meant to honor Mary Edith. Its bright colors and symbolism are my tribute to her. 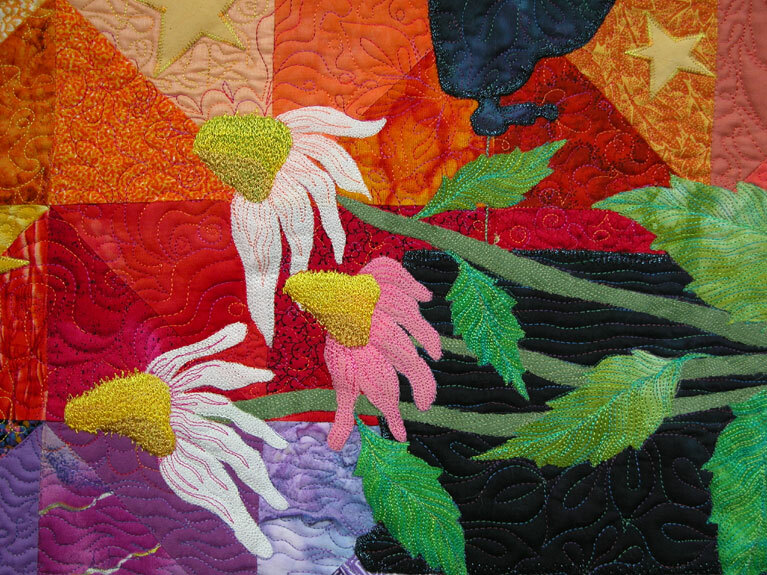 It is machine pieced, appliquéd, embroidered and quilted. The edges are bound with 2 fabrics; a black and white stripe on the upper edges; and a black and bright stripe on the lower. I like how the change in binding gives a different feel to the edges.